A longer version of this article appears as the editorial in the Summer 2018 issue of Renewal. Largely unnoticed by its enemies within and without, the Corbyn Project is cohering around a programme for transformative change that could form the basis for a new political-economic settlement. 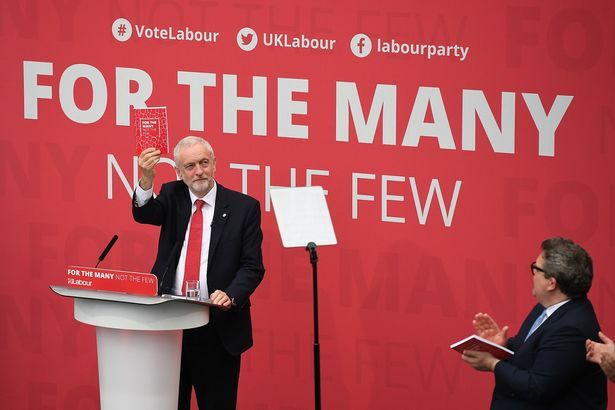 Building on popular elements of the 2017 manifesto, For the Many Not the Few, and encompassing cutting edge thinking from the Alternative Models of Ownership report and beyond, Labour’s leadership is assembling the tools and strategies to enable a Corbyn government to pursue a bold transformation of the British economy organised around ownership, control, democracy, and participation. This could amount to a radical programme for dismantling and displacing corporate and financial power in Britain, constraining and undermining the social and economic basis of the neoliberal order just as Thatcher destroyed her opponents’ strength by liquidating the public sector, shuttering entire industries, smashing the trade unions, and disinvesting in working class communities. This ‘institutional turn’ in Labour’s thinking under Corbyn is a direct response to the magnitude of the challenges now confronting Britain. These deepening problems – wage stagnation, underinvestment, low productivity, widening inequalities of income and wealth, and the looming effects of climate change – are not simply accidental or the result of poor policy choices but the predictable outcomes of the basic organisation of the economy. The institutional arrangements at the heart of today’s British capitalism – concentrated private ownership, corporate dominance, and the overweening might of London-based finance capital – together form a powerful engine for the extraction of value. More than half of all wealth in the United Kingdom is now held by the top ten per cent, with around twenty per cent held by the top one per cent. If we are serious about addressing real economic challenges then we need a different set of institutions and arrangements capable of producing sustainable, lasting, and more democratic outcomes – an economy ‘for the many not the few’. Remarkably, Labour is now promising to deliver this. Not since the ’seventies and early ’eighties – when the Party was committed to bringing about what Tony Benn termed ‘a fundamental and irreversible shift in the balance of power and wealth in favour of working people and their families’ – has Labour put forward as bold an economic strategy. Instead of the extractive and concentrating forces of corporate capitalism, the emerging ‘new economics’ is circulatory and place-based, decentralising economic power, rebuilding and stabilising regions and local communities, allowing for the possibility of real democracy and participation, and providing the long-run institutional and policy support for a new politics dedicated to achieving genuine social change. It’s easy to miss just how radical all this really is, in the original sense of getting at the root of the matter. When it comes to economic fundamentals, there has been a decades-long deficit of new thinking on the left. Where they have not capitulated totally to neoliberalism, most social democrats have been splashing around far downstream from where the real action is, seeking a way forward through ‘tax-and-spend’ transfer policies and modest redistribution. But given that returns to capital are increasing at the expense of labour’s share, it’s only natural that we should be looking at broadening and democratising ownership. Ultimately, a truly impactful alternative left strategy must go after capital itself. Who owns and controls capital is among the most fundamental questions of political economy. For socialists, responses to capitalist private ownership of the economy have traditionally divided along two main lines. In greatly simplified terms, state socialism placed ownership and control of capital with the state, whereas social democracy left it largely in private hands but sought to redistribute the returns through taxation and transfers. A neglected third tradition, largely eclipsed by the left’s two great twentieth-century projects, is to be found in the long-running socialist commitment to economic democracy. The central idea of economic democracy is the notion of extending principles of popular sovereignty from the realm of politics and governance into economics. The Labour Party is no stranger to the institutions involved, as many of them have their origins in the struggles of the nineteenth- and twentieth-century European workers’ movement. In Britain in particular, economic democracy has a long and impressive lineage going back to the dawn of the industrial revolution. The modern cooperative movement, which boasts a billion members worldwide, can be traced back to the Rochdale Pioneers. Real-world examples of democratic, participatory economic alternatives exist in communities across the globe. Worker ownership, cooperatives, municipal enterprise, land trusts, public banks, and a host of kindred institutional forms all represent ways in which capital can be held in common by small and large publics. They illuminate how practical new approaches can generate innovative solutions to deep underlying problems. They embody alternative design principles, relying not on regulatory fixes or ‘after-the-fact’ redistribution but on fundamental structural changes in the economy and the nature of ownership and control over productive wealth that go to the heart of our current difficulties – and are capable of producing greatly improved distributional and social outcomes. Virtually alone amongst the parties descended from the Second International, Corbyn’s Labour is now charting a course beyond neoliberalism, reanimating British politics through a vision of democratising the economy. Widely described as a (merely) social democratic programme, For the Many Not the Few in fact contains the seeds of a radical transformation beyond social democracy. Policies such as taking the major utilities, railways, and postal service back into public hands, establishing a national investment fund to help ‘rebuild communities ripped apart by globalisation’, linking public sector procurement to a regionally balanced industrial strategy, creating a national investment bank and a network of new regional public banks in support of small and medium-sized enterprises, and democratising ownership by supporting co-ops and worker-owned firms, all represent a break with neoliberalism. In combination with a commitment to devolving and decentralising power and decision-making to local communities, and forming a Constitutional Convention that ‘will look at extending democracy locally, regionally and nationally, considering the option of a more federalised country’, a very different pattern of political economy begins to appear. There are huge potential benefits to pursuing a massive expansion of democratic ownership in Britain. The coming ‘silver tsunami’ of retiring baby boomer business owners, and the succession question this raises for large numbers of firms that might otherwise be wound down or gobbled up by private equity, means that the time for such an expansion is now. For the Many Not the Few calls for a ‘right to own’, which would give workers the right of first refusal when their companies are up for sale. Alternative Models of Ownership takes this further, urging local public authorities to actively support and fund the incubation and expansion of worker co-ops and other social enterprises as part of their local economic development strategies – as is now happening in cities across the United States, as well as closer to home with the celebrated ‘Preston Model’ of community wealth building. At the same time, Labour is promising to help reconstitute the social basis for popular power through a long-overdue repeal of the Thatcher restrictions on trade union activity. The Party has already adopted the Institute of Employment Rights’ Manifesto for Labour Law, a suite of policies that would completely change the context in which Britain’s trade unions operate, introducing a Ministry of Labour to represent the interests of workers in government, promoting sector-level collective bargaining, and creating a system of Labour Courts with specialist judges and a new legal entitlement to engage in secondary strike action. The IER agenda fits with the suggestions made by Tony Atkinson in his final book, Inequality: What Can Be Done?, for changes that would once again permit trade unions to exercise the ‘countervailing power’ against bosses that has been so eroded over the past forty years. Taken as a whole, the essence of Labour’s ‘institutional turn’ is to bring about an egalitarian rebalancing of power through a reordering of the basic institutions of the economy. ‘I want us to surpass even the Attlee government for radical reform’, John McDonnell has said. ‘The situation demands nothing less’. The historical comparison is apt. Twice in the course of the last century, radical reforming British governments of the left and then of the right brought about fundamental transformations of Britain’s political economy on the basis of significant changes in ownership. In the first instance, the nationalisations of the 1945-51 Labour governments brought the Bank of England, coal, steel, civil aviation, the railways, and all the major utilities (electricity, water, and gas) into public hands. By 1951, Labour had assembled a public sector workforce of four million, eighteen per cent of the total, while a fifth of the economy was in public ownership. Despite a great deal of mythology to the contrary, the nationalised industries were actually quite efficient, outperforming both their US privately owned counterparts and British manufacturing as a whole in terms of total factor productivity. For all its shortcomings, this remains today the most radical and far-reaching economic reform programme ever implemented in Britain. The Conservative governments of Margaret Thatcher and John Major substantially reversed the earlier transformation of ownership. The commanding heights of the economy were delivered up for auction. Between 1980 and 1996 Britain racked up forty per cent of the total value of all assets privatised across the OECD, a massive transfer of wealth from public to private interests. Privatisation not only allowed for attacks on the trade unions and a restoration of capital’s ‘right to manage’ but was also instrumental in the build-out of London-based capital markets. The £3.9 billion rollout of shares in BT in 1984 was six times larger than any previous stock offering. In this way the serial privatisations of the Thatcher period helped secure the ascendancy of finance capital and the City. The ‘Right to Buy’ policy, by which local authorities were forced to sell council housing to any sitting tenant able to purchase their homes at discounts of up to fifty per cent, was by far the biggest of the Thatcher privatisations, explicitly targeting swing voters to create a mass constituency for the new politics. As Thatcher famously said, ‘Economics are the method; the object is to change the heart and soul’. This lesson should be at the forefront of left thinking as part of any effort to bring about a systematic institutional obliteration of neoliberalism. Labour’s institutional turn now holds out the promise of a third landmark phase-change in the country’s economic development. Like the Attlee government confronted with the most obdurate and reactionary sections of British capital, Corbynism too faces dominant social forces that must be dismantled and dissolved if Labour’s stated aim of a fairer, more democratic economy is to be realised. The last several decades have seen the steady elevation of the interests of the City over the real economy, with significant consequences for the rest of us. Left-leaning economists have shown how this ‘financialisation’ of our economic life is behind many of the dangerous trends we are experiencing, such as increased income inequality and wage stagnation, driven by the progressive transfer of income from the real sector to the financial sector. Haute finance is also a source of tremendous instability and risk – the real proximate cause of the past decade of crisis and austerity. Thanks to Labour’s newfound boldness, we are within sight of another revolution in ownership. But replacing neoliberal capitalism does not mean a mere reversion to the past. It is clear that a Corbyn government would not simply resurrect the postwar model of public ownership – that of large, top-down, centralised public corporations run by mandarins. McDonnell has spoken of the limitations of such bureaucracies, stating that ‘the old, Morrisonian model of nationalisation centralised too much power in a few hands in Whitehall. It had much in common with the new model of multinational corporations, in which power is centralised in a few hands in Silicon Valley, or the City of London’. The alternative, he argues, is plural forms of democratised and decentralised common ownership at a variety of scales: ‘Decentralisation and social entrepreneurship are part of the left … Democracy and decentralisation are the watchwords of our socialism’. This dual emphasis on democratised ownership and radical political decentralisation is truly remarkable coming from the national leadership of a major political party. All around the world, parties of the left and centre left are adrift or in crisis and decline, unsure of their intellectual orientation. In some cases the left has split into rival camps, mired in mutual antipathy. The UK is a promising exception to this general malaise. Corbyn’s Labour, as a radical democratic socialist government-in-waiting, represents a historic opportunity, unmatched by the present position of the left in any other advanced industrial country, for the creation of a new economic model – one that, if successful, could be emulated far beyond our borders. The Corbyn Project thus merits support across the left, from people of diverse ideological backgrounds and persuasions, as quite simply the best available chance to advance economic solutions commensurate with the scale of our problems. The task is now to put flesh on the bones of this transformative agenda in the face of the deep structural challenges of a fluid and rapidly changing UK political and economic landscape, and to put it into effect – thereby creating an economy that works ‘for the many not the few’. Joe Guinan is Executive Director of the Next System Project at The Democracy Collaborative, and is a Commissioning Editor for Renewal. Martin O’Neill teaches at the University of York, and is a Commissioning Editor for Renewal.